Annie Alexis didn’t know who to help first. So many things were happening at once, she said. People were screaming, others were bleeding and some appeared to be dead. 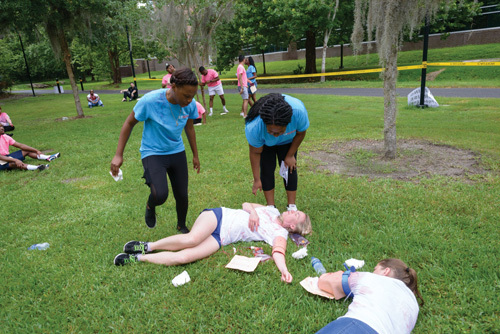 On the morning of June 7, the University of Florida’s Summer Health Professions Education Program, or SHPEP, held a mass casualty incident exercise where Alexis and 78 other students learned how to assess injuries and treat victims at a pace they could expect if this were a real emergency. Sirens, screams and smoke filled the air as yellow caution tape cordoned off curious passers-by trying to catch a glimpse of the scene unfolding near UF’s College of Public Health and Health Professions. “Even though it was fake, it was still overwhelming,” said Alexis, a UF pharmacy sophomore. Supervised by Jason Jones, M.D., Desmond Fitzpatrick, M.D., and Charles Hwang, M.D., all with the UF College of Medicine’s department of emergency medicine, the drill gave students interested in medical careers a chance to practice lifesaving skills in an emergency situation. Before they were sent out to treat the pretend victims, the students learned from local first responders how to stop a person‘s bleeding, how to make sure their airways were not restricted and how to properly apply a tourniquet. 80 students in the UF SHPEP program at UF Health participated in a drill to teach them how to respond to a mass casualty incident. Local first responders were on the scene to coordinate and train the students. In two-person teams, they dashed through the scene, applying the principles of triage to assess the injured. They tagged each person according to the severity of their wounds — from green, meaning walking wounded, through yellow and red to black, or fatal. Emergency medicine residents and UF Health students volunteered as the patients during the exercise. Theatrical blood made their injuries realistic to the trainees. Joseph Washington, a UF pharmacy student, portrayed a victim with a severe head trauma. The students should run right by him in order to assist others with less-critical injuries, he said. Doreen Derak, a UF sophomore and SHPEP participant, said she feels more prepared to handle a potential crisis after attending the exercise. Although she has never experienced a mass casualty, Derak said as a medical professional, she might have to face one. Hwang, who is also a clinical assistant professor in the department of emergency medicine, said it’s important for everyone to know how to help when disaster strikes because of the increasing frequency of mass shootings and terror attacks. “Unfortunately, that’s just the current state of affairs throughout the world,” he said. Hwang defined a mass casualty as any event in which available emergency medical services and personnel are too limited to serve the number and severity of wounds caused by a sudden incident. 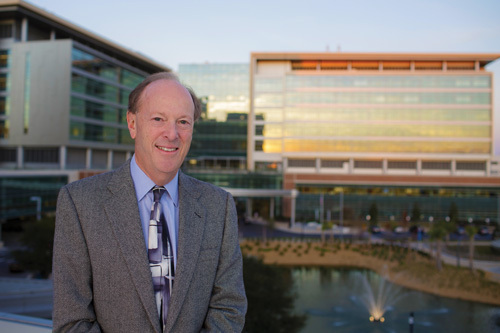 Jones and Fitzpatrick, both assistant professors of emergency medicine, called the exercise one of the most important events during the six weeks of the SHPEP program, which is now in its second year at UF. “They won’t forget the day that they came in and saved victims in a simulated mass casualty,” Jones said.